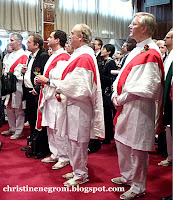 Don’t say that airline executives are stuffed shirts because today two dozen of them including United's Jeff Smisek, Air Canada's Calin Rovinsecu and Lufthansa's Christoph Franz gathered to welcome the newest member of the Star Alliance wearing flowing tunics, brightly colored sashes and sandals – no socks. When Ethiopian Airlines boss Tewolde Gebremariam and Jaan Albrecht of Star Alliance signed the documents, Ethiopan became the 28th member of the airline network and Ethiopian threw among other things, its 40 African and 15 Middle East and Asia destinations into the pot. “We were very keen to get Ethiopian,” Albrecht told me after the papers were signed, the photos taken and the cake and champagne served. 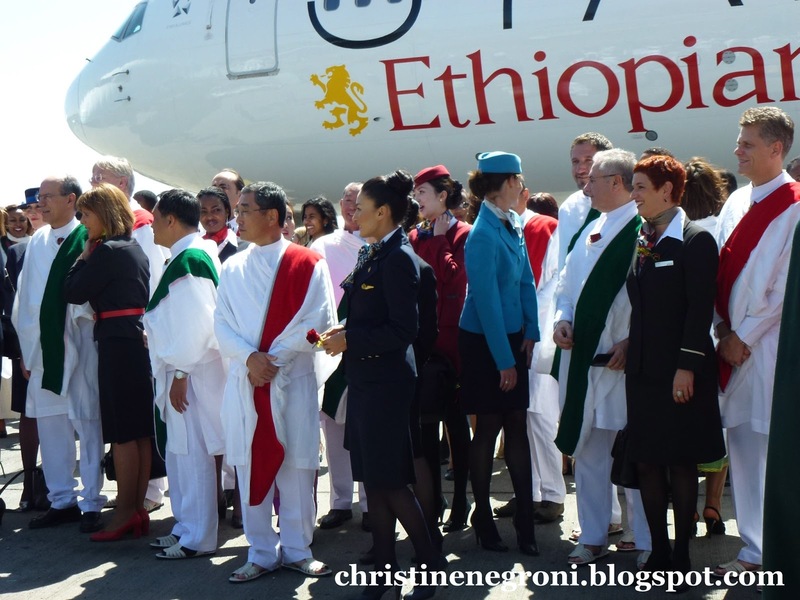 With South African Airways handling the southern region of the continent and EgyptAir the north, Ethiopa fills a need in the center of Africa. 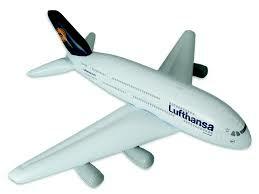 There’s more to this than just expanding Star’s already well-filled out global web of air routes. The newest member brings the number of Star Alliance destinations to nearly thirteen hundred and the number of countries served to 189. “We consciously decided we needed global reach. The more countries, the more destinations, the more appealing our product to customers in any part of the world,” Albrecht said. From Gebremariam’s perspective, joining the alliance is another step towards the airline's meeting its 2020 plan in which the 45-year old company becomes the leading airline in Africa for passenger, cargo, training and maintenance and overhaul. 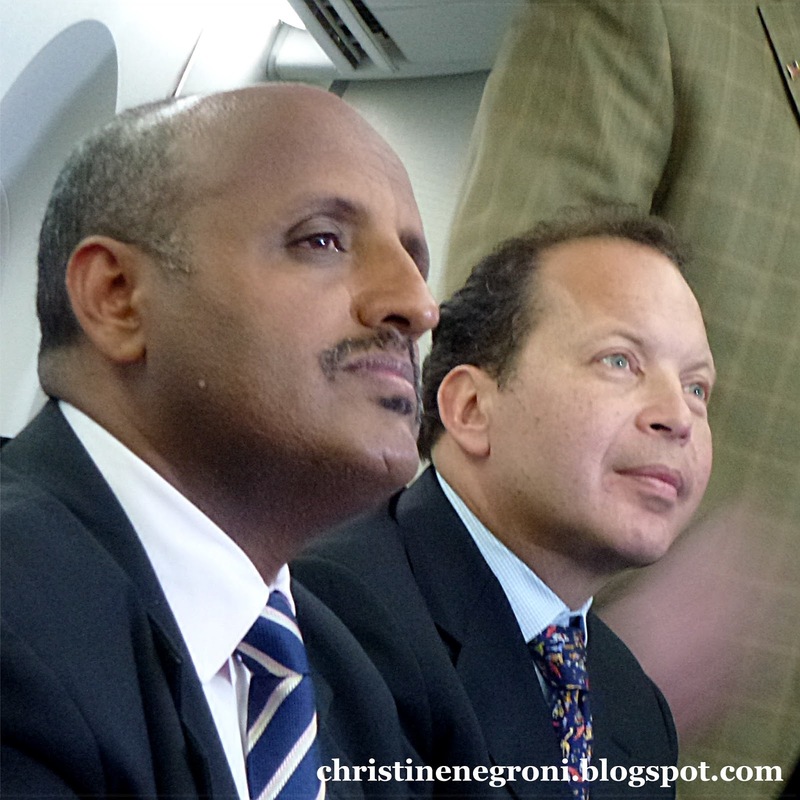 This is more than just business, to hear Gebremariam tell the story, considering the relationship between aviation and economic development. When executives tout a business and marketing arrangement as revolutionary social change, they need to bring more than cake to the party. Enter stage left, the airplane Boeing's Katherine Overby calls the "game changer." Yep, in anticipation of the 2-day Ethiopian Airlines/Star Alliance extragavanza, the Dreamliner touched down for the first time on the African continent in Addis Ababa on Sunday. 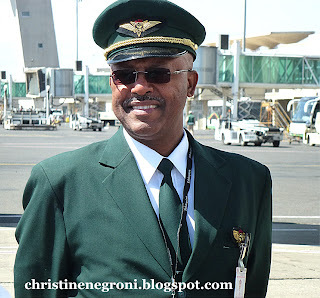 Also for the first time, an African pilot, Capt. Desta Zeru was at the controls. Today the star alliance executives and some lucky Ethiopian employees went for a fly around. 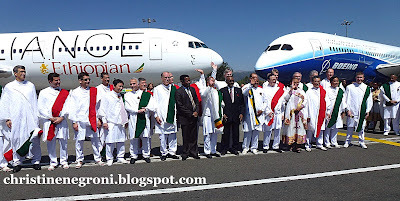 The visit is part of Boeing's six month world tour for the Dreamliner but it's also their way of saying "Thanks" to Ethiopian for its purchase of ten 787s. The first to arrive should start service here sometime in 2012. New airplanes, new alliances, new travel and migration patterns giving rise to hopes for a new Africa, why, it’s enough to convince the airline bosses to lighten up and go native. Shazam! 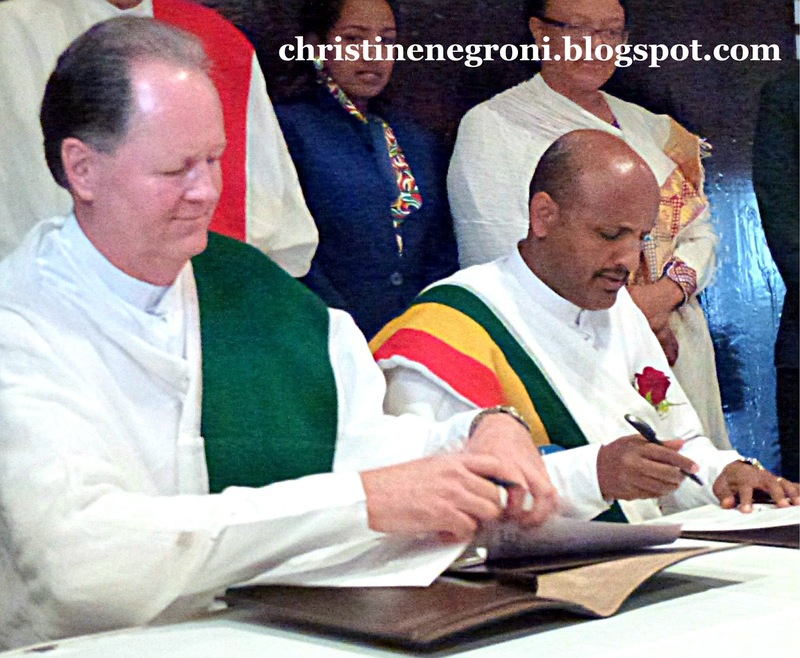 Is that a female Ethiopian F/O in the second-from-last pic? That trumps all those doofi in bedsheets. Go-Baby! EAL has at least one female pilot. I've heard a woman's voice on the radio a few times on flights into Africa. Maybe that's her in the photo! 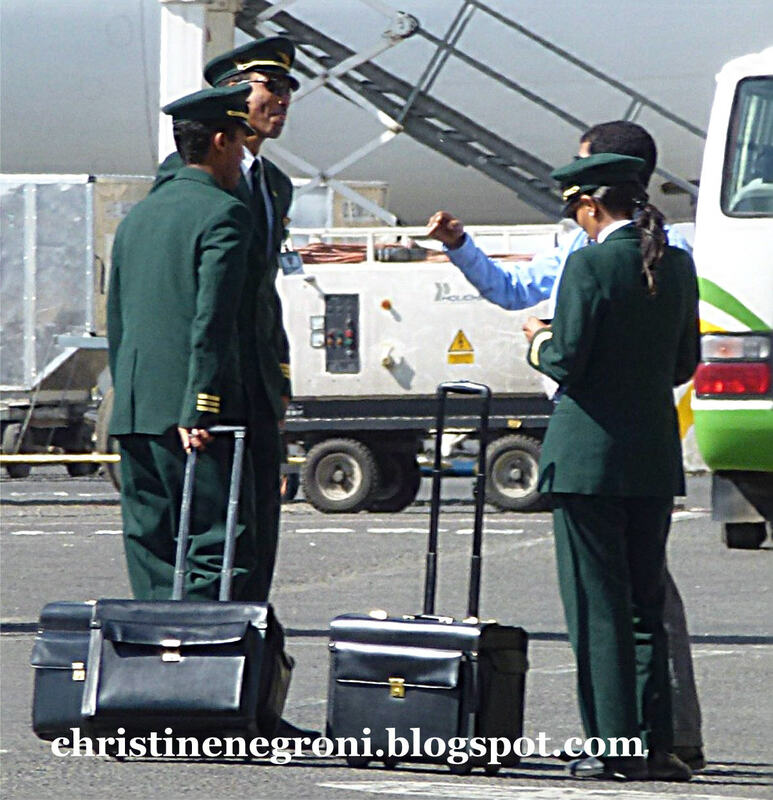 I love those green uniforms worn by Ethiopian crews. EAL is a proud carrier. ...three men in olive uniforms stand next to me at a doorway. They are straight and tall with skin like cinnamon — that distinct, horn-of-Africa brown. 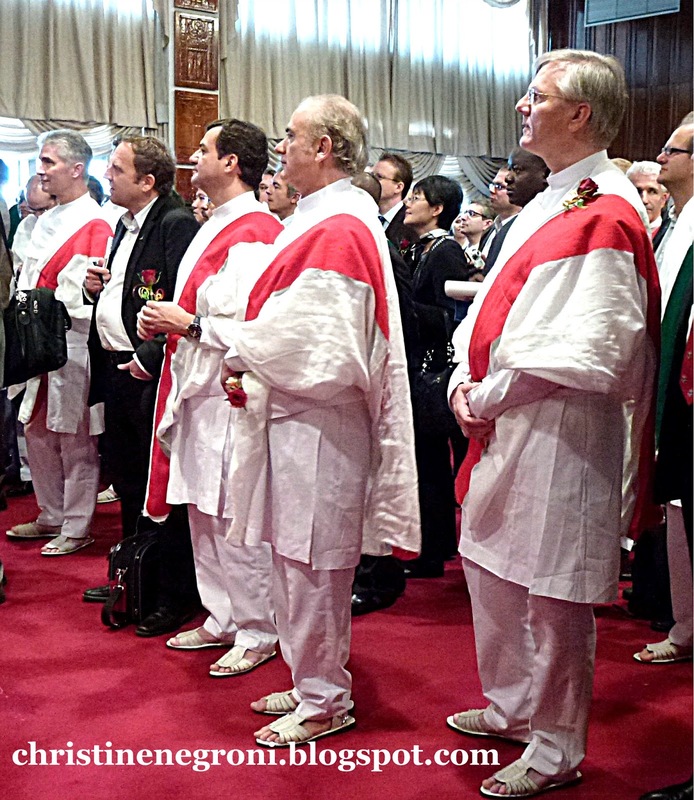 Their suits are crisp and spotless, with gold hashmarks and sharply crested hats. The captain looks at his watch, and you can almost hear his sleeve — stiff as ironed aluminum — snapping taut like a sheet. I am tired and sweaty and the wheels of my luggage need oil. The three men nod without smiling. I know they are pilots, but their impression is almost one of soldiers, of an elite military unit protecting some corrupt head-of-state. 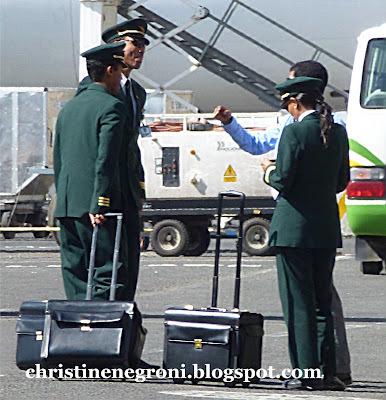 Surreptitiously I read the tags affixed to their cases, and I learn they are a crew from Ethiopian Airlines. Minutes earlier I’d spotted their jet parked on the fog-shrouded tarmac, its old-fashioned livery a throwback to an earlier, more prestigious time: three colored stripes twisting sharply into a lightning bolt, bisected by the figure of the Nubian lion. High on the tail the letters EAL fill three diagonal flashes of red, yellow, and green. I feel my pulse quicken. “Nice flight?” I ask the captain. “Addis,” he says. And of course he is referring to Addis Ababa, that mysterious Ethiopian capital. “By way of Bahrain,” he adds. He speaks quietly, flatly, but his voice is dark and full of command. At well over six feet, it feels that he’s looking down at me from a great distance, sizing me up with the same grievous scrutiny he’d give a bank of approach lights appearing out of the Addis fog. I look at the smooth brown face of the first officer, and it strikes me that he’s probably no older than twenty-five, a fact obscured by the seriousness of his uniform. I remember myself at that age, and I’m unable to decide in what amounts his presence mocks, dishonors or impresses me. Here’s this young man who somehow rose from the rugged, war-torn highlands of East Africa to unprecedented dignity, carrying his nation’s flag to places like Rome and Moscow and Beijing. In his passenger cabin, Ethiopian traders, Russian bankers and Eritrean warriors fling themselves to impossible corners of the world. And the next time somebody asks why I chose to become an airline pilot, I’ll stammer and stare off, wishing I could just spit out the image of these three men in the doorway. I already know that later I will try to write this down, and when I do it will be impossible to find the right words..."
Grumpy, you are right yes indeed that was a female in uniform. 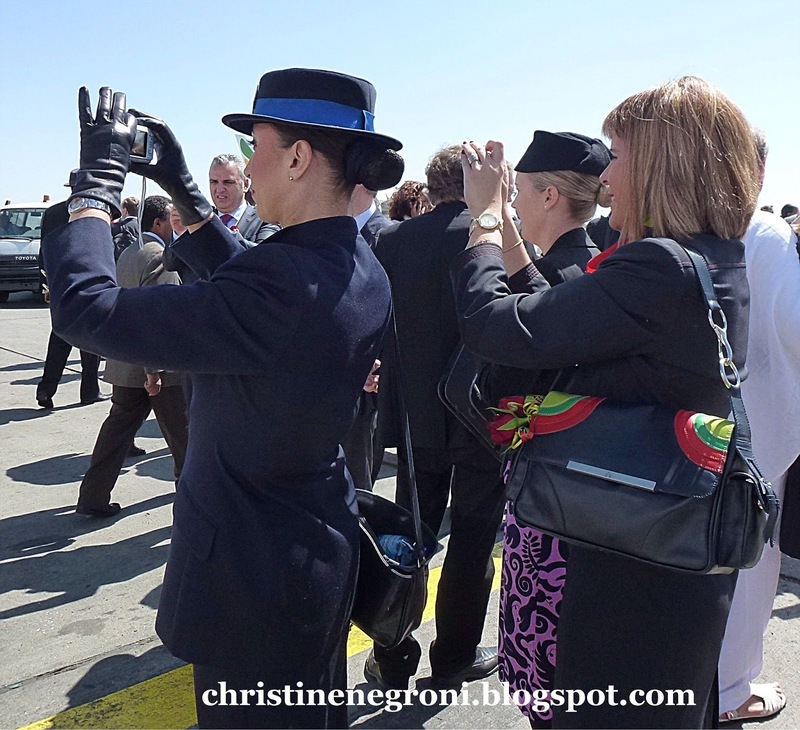 She is a Captain on the Q400.